The Best Western Greentree Inn & Suites is located just off I-35, Exit 118 - 12th Street on service road, and not far from I-240 and I-44 Highways. Perfect location to visit our downtown entertainment Bricktown District for a day to play or a night to enjoy with friends. We offer comfortable accommodations at an unbeatable value. 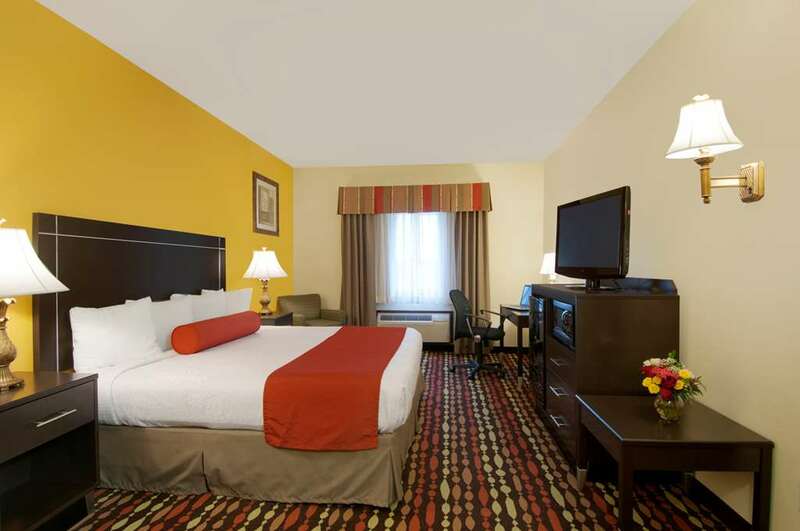 Enjoy comfortable a variety of room types such as mini suites or extended stay suites. All our rooms have cable satellite television with HBO and free high-speed internet access throughout hotel. Other great amenities are our complimentary hot breakfast every morning, a heated indoor swimming pool and a fully equipped exercise facility. Pets are also welcome to stay. Being close to the highway you are minutes from the Cheasapeak Area, Myriad Gardens, Cox Convention Center, OKC Zoo, Murrah Federal Memorial and just a few more miles from Will Rogers World Airport, Oklahoma Western Hertiage Musuem. We are just blocks from the Buck Thomas Ballpark as well. If headed to Norman we are minutes from all its great attractions as well such as the OU University and Loyd Noble Area. The friendly and professional staff is waiting to welcome you and ensure your stay is experience to remember. Book your rooms today and enjoy your new home away from home. Wendy's: 0.50 mile(s) from Wendy's, Fast Food, American, Open for: lunch, dinner, 10:00 a.m. to 1:00 a.m.
WESTERN SIZZELERS: 0.50 mile(s) from WESTERN SIZZELERS, Full Service, American, Open for: lunch, dinner, WALKING DISTANCE FROM THE PROPERTY OPENS AT 11:00 a.m. to 10:00 p.m.
From: All directions. Take Interstate 35 to 12th Street, go north and take Exit 118 onto Moore. The Best Western Greentree Inn & Suites is located on the west side of the interstate, just north of 12th Street.